From romantic escapes in our luxurious Theme Rooms to corporate stays in our tasteful hotel rooms, Studio and One Bedroom Suites, we have the perfect accommodations for any traveller. Enjoy the gorgeous West Coast in our North Vancouver hotel close to the downtown core without the noise, congestion or pricey rates. 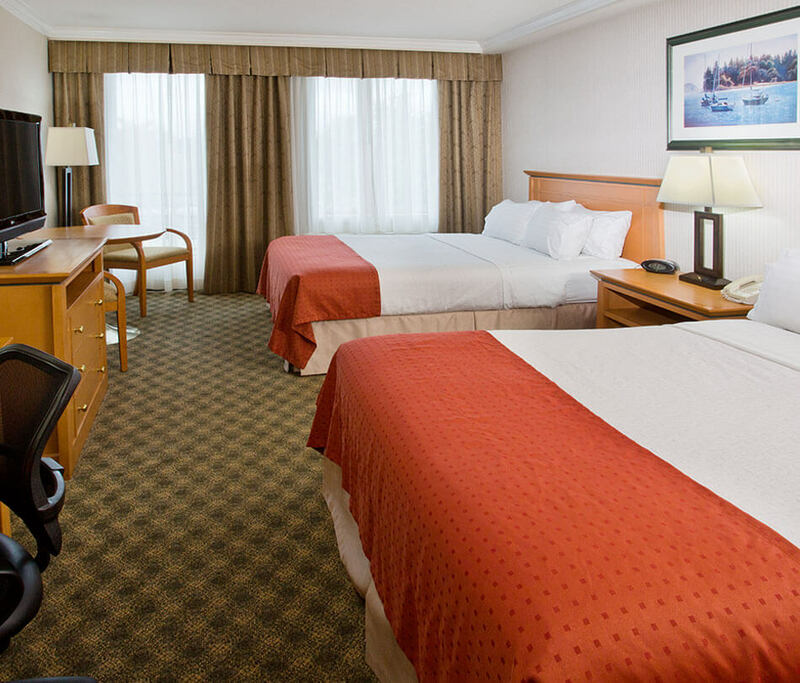 Designed with your comfort in mind, all of our rooms and suites feature free high speed Wi-Fi, a personal safe, mini-fridge, microwave, coffee station, and more, plus access to the hotel’s comprehensive amenities and services. 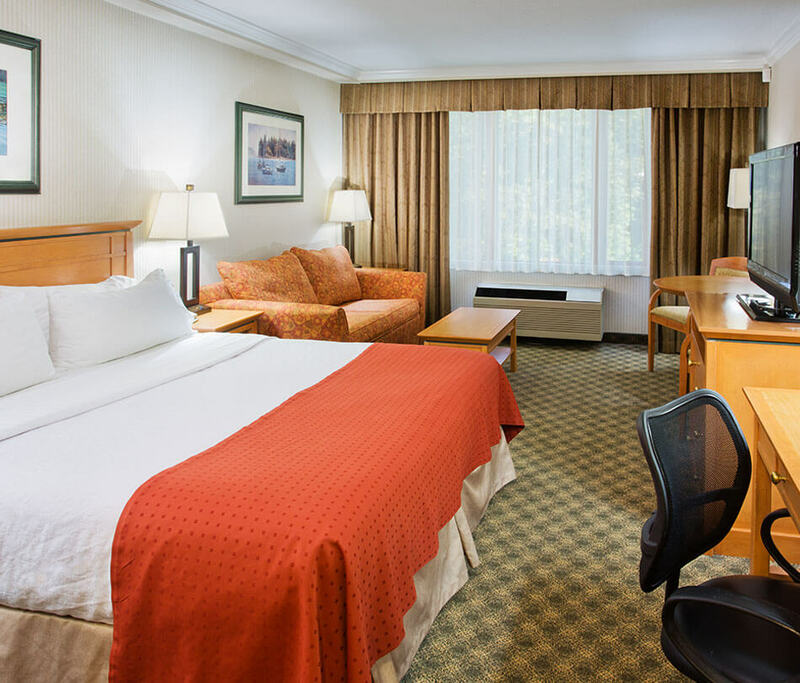 Guests on the hunt for hotels with disabled access can rest easy at Holiday Inn & Suites North Vancouver - we offer several accessible accommodation options with specially-designed features to make you feel right at home. Book your room or suite online and enjoy our lowest Internet price guarantee. Choose from a selection of well-designed room options to create your perfect stay experience at Holiday Inn & Suites North Vancouver. Don’t forget to check out our special offers and packages for extra savings on excellent Vancouver accommodation. 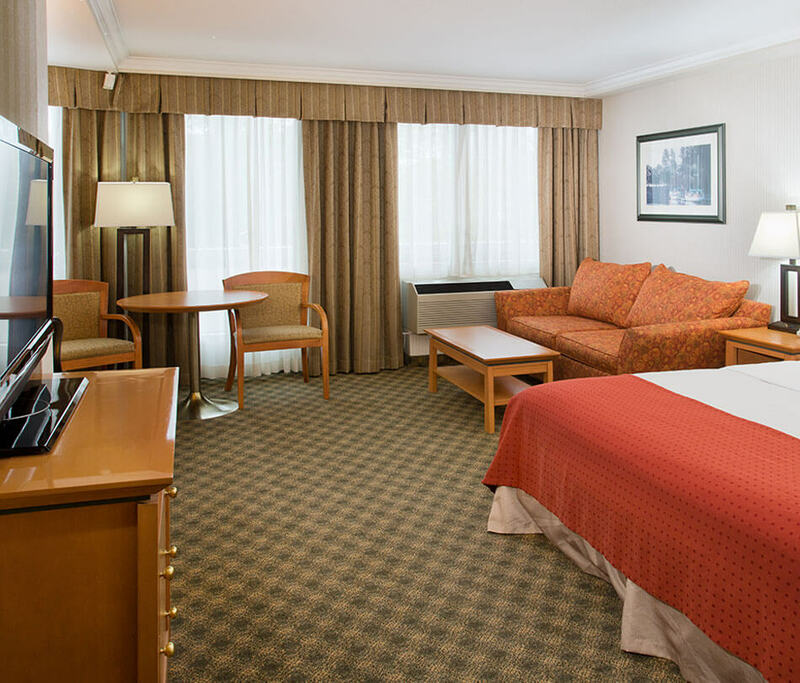 Make yourself at home in our spacious King Room featuring a top-of-the-line Serta/Simmons mattress and host of convenient amenities including a 37”flat screen TV, mini-fridge, microwave, complimentary coffee and tea/maker, free high speed Wi-Fi, in-room personal safe and more. This room is also furnished with a comfortable work desk and chair, as well as a pull-out sofa. Perfect for families or shared accommodation among friends, this room offers plenty of space and two comfortable Queen beds with top-of-the-line Serta/Simmons mattresses. Enjoy a mini-fridge, microwave, a coffee station with complimentary coffee and tea, free high speed Wi-Fi and 37” flat screen TV, as well as a desk area with a comfortable office-style chair. The Deluxe Double Queen option also features a convenient space-saving kitchenette with a two-burner stove top and sink. Settle into this well-designed Studio Suite with a King bed and top-of-the-line Serta/Simmons mattress, and spacious seating area with a coffee table and 37” flat screen TV. Prepare simple yet delicious meals in the kitchenette nook featuring a sink, two-burner stove, mini fridge, coffee station, microwave and dining table with two chairs. This suite is furnished with a generous work desk area and comfortable office-style chair and a pull-out sofa for extra guests. Additional amenities include free high speed Wi-Fi, an in-room personal safe and more. Ideal for corporate guests and families, this unit offers a separate bedroom and spacious living area with an open-concept kitchenette. Relax in a generous arm chair or pull-out sofa in front of a 37” flat screen TV in the main living space, and the convenient kitchenette featuring a mini-fridge, microwave, sink, stove top burners and coffee maker. The private bedroom offers one King bed with a top-of-the-line Serta/Simmons mattress, a 37” flat screen TV and a work space accompanied by a comfortable office-style chair. Additional amenities include free high speed Wi-Fi, an in-room personal safe and more. 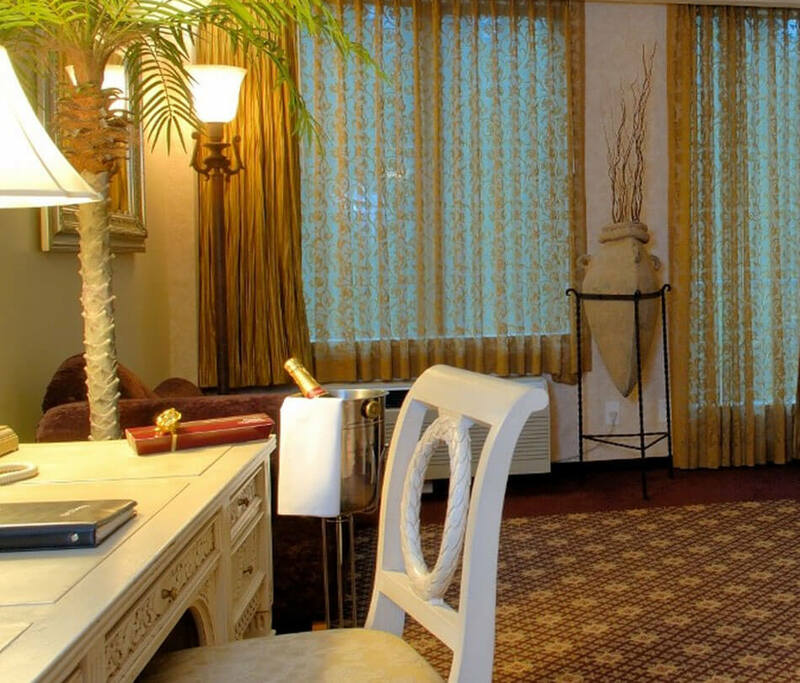 Experience an Arabian night or romantic evening in Rome with one of our luxurious theme rooms right here in North Vancouver. These deluxe suites are perfect for honeymoon escapes, anniversary celebrations or other special occasions, and feature a gas fireplace, a relaxing Jacuzzi tub, an extravagant King-size bed and inspiring décor and finishes to make you feel like you’re a million miles away. Designed for couples on a romantic getaway, these luxurious suites are for adults only - no kids, please! The theme rooms are in high demand, so check out our Theme Room Package and call us to book early! 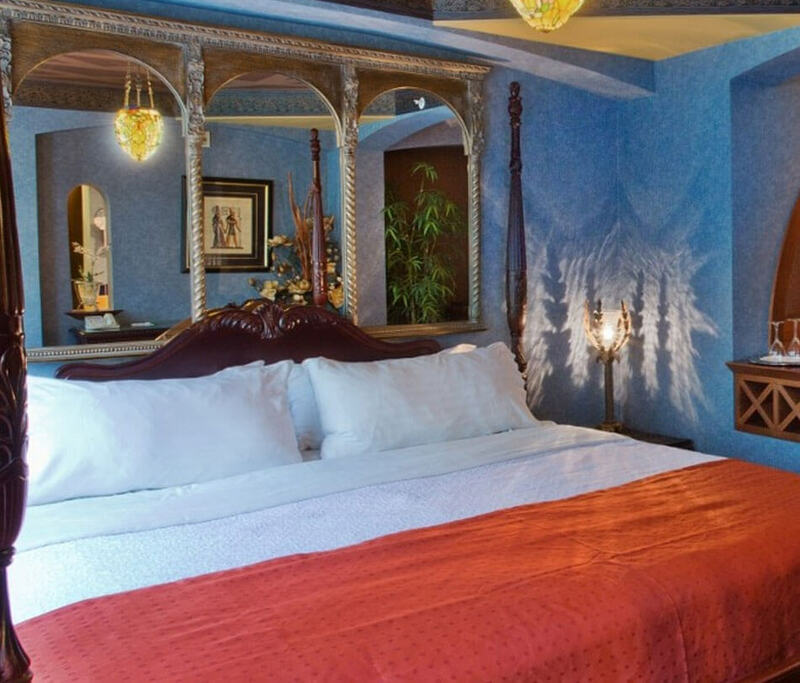 Indulge yourself with a night in our exotic Arabian-themed suite featuring a large Jacuzzi tub, a full King bed with a top-of-the-line Serta mattress and romantic fireplace. Distinct Middle-Eastern-inspired features include tiled floors, Arabic-style seating with rolled cushions, opulent drapery and curved architectural components. This suite also features a convenient kitchenette with a stove top, mini-fridge, microwave, sink and coffee machine. Additional amenities include a fireplace, a work desk and chair, a 37” flat screen TV, free high speed Wi-Fi, an in-room personal safe and a large bathroom with a Jacuzzi tub, vanity mirror and complimentary bath robes. Escape to ancient Italy in our stunning Roman theme room. This spacious suite features opulent Roman-style décor, including a grand gas fireplace, soothing tones of cream, deep red, and soft yellows and oranges, and period-style furnishings. Sink into a dreamy King-size bed after a relaxing soak in the Jacuzzi tub in the large en-suite bathroom. 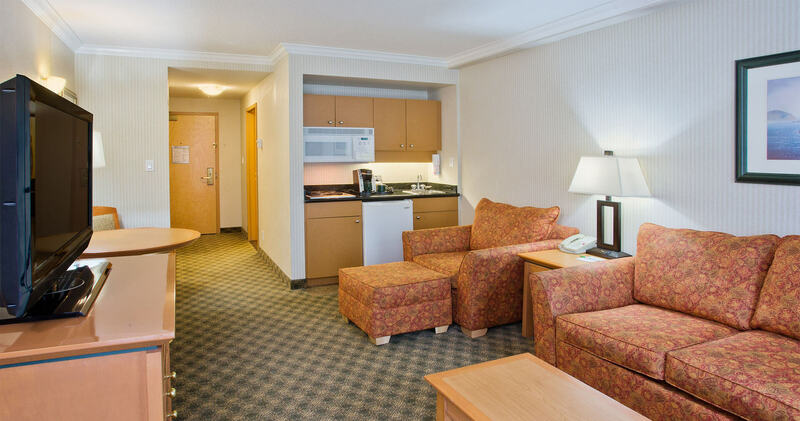 This suite also features a convenient kitchenette with a stove top, mini-fridge, microwave, sink and coffee machine. Additional amenities include a work desk and chair, a 37” flat screen TV, free high speed Wi-Fi, an in-room personal safe and a large bathroom with a Jacuzzi tub, vanity mirror and complimentary robes. 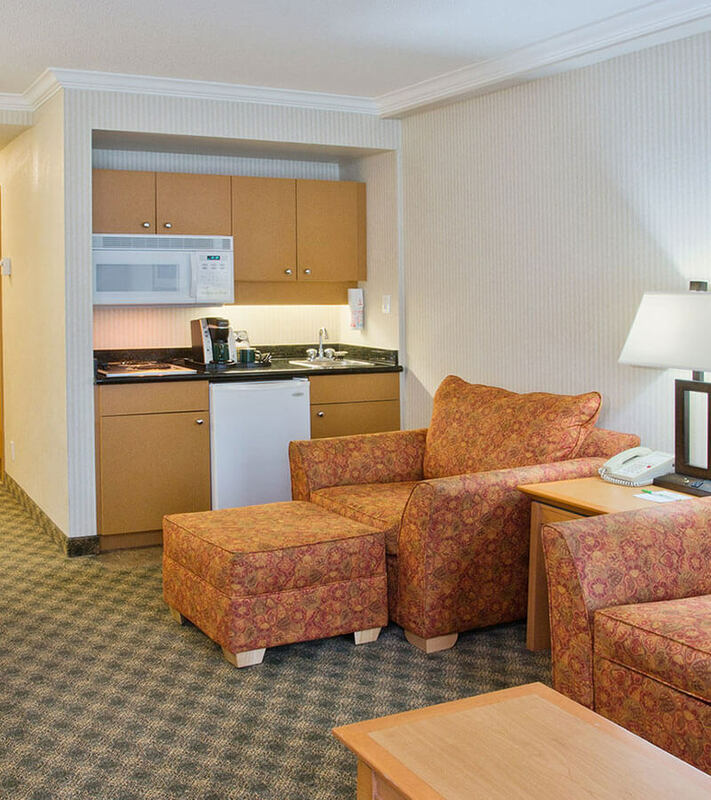 Holiday Inn & Suites North Vancouver offers five wheelchair accessible rooms with a range of convenient features designed to make your stay as comfortable as possible. Our accessible room options are the King Room or the Double Queen Room, inclusive of all listed in-room amenities. To book an accessible room, please call the hotel directly to ensure your room will have all the features you require.